In order to template the RadDocking control you have to use Expression Blend. Open the UserControl containing your RadDocking and select it. Right-click on it and from the context menu select Edit Template -> Edit a Copy. You will be prompted for the name of the style and where to be placed within your application. After clicking the OK button, a style with target type RadDocking will be created and the Expression Blend will bring you into editing the control's template. 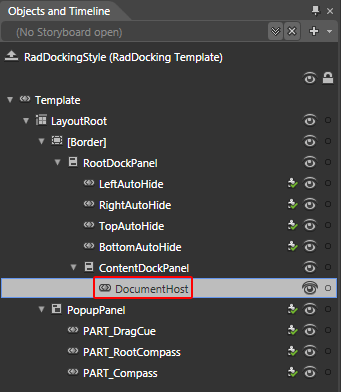 To learn more about the structure of the RadDocking's template take a look at this topic. Depending on your case you can modify different things in the template. For example, if you don't use the Document Host, you can set its Visibility to Collapsed in the template. For this purpose select it in the 'Objects and Timeline' pane. Modify its Visibility property, so it has its value set to "Collapsed".